The aim of this paper is to describe the different steps of the endoscopic endonasal approach to the sella turcica. Messerer, M., Cossu, G., George, M., Daniel, R. T. Endoscopic Endonasal Trans-sphenoidal Approach: Minimally Invasive Surgery for Pituitary Adenomas. J. Vis. Exp. (131), e55896, doi:10.3791/55896 (2018). Endoscopic endonasal trans-sphenoidal surgery has become the gold standard for the surgical treatment of pituitary adenomas and many other pituitary lesions. Refinements in surgical techniques, technological advancements, and incorporation of neuronavigation have rendered this surgery minimally invasive. The complication rates of this surgery are very low while excellent results are consistently obtained through this approach. This paper focuses on the step-by-step surgical approach to pituitary adenomas, which is based on personal experience, and details the results obtained with this minimally invasive surgery. The introduction of endoscopic techniques to the skull base surgery has markedly improved the outcomes of skull base surgery when used in itself or as an adjunct to standard microsurgical approaches. The endoscopic endonasal approach was initially introduced to treat sellar lesions1, but during the last two decades the applications of this technique have expanded thanks to significant technological improvements and increased surgical experience. The endoscopic approach is now also used for lesions of the anterior and antero-lateral skull base through extended midline and paramedian approaches. Approaches from the anterior skull base to the odontoid are now safely performed in many specialized centers with satisfying results2,3,4,5. In fact, the endoscope allows a direct visualization of the lesion through a natural access without crossing important neuro-vascular structures. Multiple reviews have sustained the safety and relative advantages of endoscopic procedures over traditional microscope-based approaches and affirmed that the major outcomes, such as the extent of tumor resection and the changes in hormonal levels, were not different between the two approaches. However neurological complications, operative time and hospitalization length, as well as patients' postoperative discomfort, were significantly lower with the endoscopic approach6. According to a provocative publication, even a less experienced surgeon may achieve a similar outcome with a fully endoscopic technique as a very experienced surgeon using a microscopic technique in a cohort of non-functioning pituitary adenomas7. The endoscopic endonasal trans-sphenoidal approach is actually widely recommended for sellar lesions, even in the case of cavernous sinus invasion or suprasellar extension. If the suprasellar extension is very important, a fully-endoscopic two-staged procedure may be performed, while waiting for the natural descent of the residue8. If the diaphragm is very tight ("waist sign"), a transcranial approach may be performed to address the suprasellar component9. Concerning the invasion of the cavernous sinus, the endoscopic technique seems to be superior to microscopic techniques for Knosp grade 2 and 3 non-functioning pituitary adenomas10, and the endoscopic endonasal inspection may help in detecting the invasion of the cavernous sinus11. Factors which might hinder an endoscopic radical excision are: tumors extending above and lateral to the supraclinoid internal artery or the presence of "kissing carotids", an asymmetric subfrontal extension, tumors reaching the foramen of Monro, or fibrous tumors invading the surrounding cerebral parenchyma9. In these complicated cases, a combined transcranial approach may be proposed to the patient. Also the pneumatization of the sphenoid sinus is an important factor in determining the feasibility of the surgery because conchal type sinuses render the endoscopic approach more challenging12. Through their personal experience of approximately 500 endoscopic endonasal approaches for pituitary adenomas, the authors here describe the different stages of the approach for pituitary tumors. The surgery may be divided into three main steps: the nasal, the sphenoidal, and the sellar phase. They are performed through a fully endoscopic procedure. The cohort here described included patients with micro or macro-adenomas with a variable extension to the cavernous sinus, to the sphenoid sinus, or the suprasellar space. Both functioning and non-functioning adenomas were included. A fully endoscopic procedure may be also performed for a variety of other lesions such as craniopharyngiomas, pituitary metastases, clival chordomas, or petro-clival meningiomas. However, these pathologies often required wider approaches and the description of these variants goes beyond the aim of this paper. The procedure described here is for pituitary adenomas (functioning or non-functioning). A suprasellar extension was not a contraindication for the procedure, nor were the extension or invasion of the cavernous sinus. The pneumatization of the sphenoidal sinus and the orientation of the septa of the sphenoidal sinus were analyzed at the pre-op CT-scan. Also the orientation of the optic nerve and the internal carotid artery were important factors to plan the surgical strategy. This surgical technique can also be useful for others tumors located in the sellar region like craniopharyngiomas13, symptomatic Rathke's cleft cysts, pituitary metastases14, or lymphomas15. Also, other lesions may be approached through the endoscopic approach, such as meningiomas of the sellar diaphragm or the sphenoidal planum, meningiomas of the petro-clival region and clival chordomas5,16, and epidermoid or dermoid cysts of the prepontine cistern. In these cases, however, a wider approach is necessary. The protocol here illustrated follows the guidelines of the human research ethics committee at the University Hospital of Lausanne. NOTE: The procedure explained here is focused on the classical approach performed for pituitary adenomas. Systematically perform a pre-operative craniofacial CT-Scan and MRI, along with the endocrinological and ophthalmological assessments. Induce general anesthesia and perform orotracheal intubation. Place the patient in the supine position after general anesthesia and orotracheal intubation. Position the head in a head holder and secure the band for the magnetic neuro-navigation around the head. Raise the head of the table to 20 ° to improve venous drainage and slightly rotate the head about 30 ° towards the neurosurgeon, while performing a contralateral head tilt. NOTE: The degree of extension or flexion of the patient's head depends upon the surgical target: slightly flexed (15 - 20 °)17 for the sella turcica approach, neutral for anterior skull base surgery, and flexed up to 45 ° for lower clival lesions. Sterilize the face with an alcohol-free chlorexidine solution. Clean the nasal fossae with an antiseptic solution before wicking with cotton pads impregnated with diluted Xylocaine 1% with adrenaline (1:1,000,000). NOTE: In addition to the local anesthesia and vasoconstriction, this wicking also provides a lateral retraction of the middle turbinate to enable the endoscopic approach. An adjustable holding arm may be fixed to the operating table to be used at specific phases of the surgical procedure (particularly during the sellar phase). However, some surgeons prefer not to fix the endoscope to have a more dynamic view of the surgical field. In these cases, they either leave the endoscope to the assistant to enable work with both hands or they hold the endoscope themselves. Clean the right abdominal quadrants and drape the abdomen while leaving a small window in the right peri-umbilical region as it represents a possible site of fat graft harvesting in the case of an intra-operative cerebrospinal fluid (CSF) fistula. NOTE: Anesthesiologists should take special care for deep morphinic analgesia and control the mean blood pressure during the nasal phase of the procedure, to reduce the bleeding due to the rich innervation of the nasal mucosa. NOTE: The choice of the side of the nasal fossa to be used primarily is determined by the nasal anatomy (septal deviation, mega-turbinate, polyps, previous surgeries, etc. ), lateral extensions of the tumor (contralateral approach to a lateral extension), and the size of the tumor (binostril approach for large tumors). In the majority of pituitary adenomas, a unilateral approach is sufficient to achieve a good exposure of the tumor and its extensions. Introduce the 0 ° short rigid endoscope (18 cm length, 4 mm diameter) into the right nostril to identify the inferior and middle turbinates laterally and the nasal septum medially. Prefer the left nostril approach in case of septal deviations, anomalies of the turbinates, or for specific tumor extensions that are detected in pre-operative imaging. Place the endoscope tube either at the superior or inferior aspect of the nostril to provide enough space to other instruments entering the nasal cavity. Gently retract laterally the middle and superior turbinates with a blunt spatula to achieve a wide access to the ipsilateral sphenoid ostium. Take care to support the superior and middle turbinates through their entire length with the spatula to avoid fractures during the retraction maneuver. Coagulate the nasal mucosa in a vertical linear fashion for about 10-15 mm with a monopolar between the sphenoid osteum and the choana, to avoid bleeding from the nasoseptal arteries (branches of the sphenopalatine arteries running at the superior margin of the choana). Open the coagulated nasal mucosa with a blunt spatula vertically until a bony contact, corresponding to the vomer, is felt. Follow the vomer anteriorly until its junction with the nasal cartilaginous septum and push it to the left side to expose the contralateral sphenoid ostium, while taking care to remain in the submucosal plane. Expose and remove the sphenoid rostrum with bone forceps and a rongeur extending the resection from one ostium to the other. This opening of the sphenoid sinus allows exposure of the exocranial skull base surface. Gently remove the sphenoid mucosa if it interferes with the sellar opening. Remove the sphenoid septum (often multiple septa are present) with rongeurs to provide a wide exposure of the sella turcica. Carefully analyze the pre-operative magnetic resonance imaging (MRI) and/or CT scan for the number and direction of these septations; this is crucial to recognize the relevant anatomy. Some of these septations may insert directly onto the carotid prominences and therefore should be identified as important landmarks during this phase of the surgery (Figure 1, Figure 2, Figure 3, Figure 4). NOTE: The CT-scan was performed using a 64-detector row-based system. Three-dimensional reconstruction was processed using a series of thin-slice data. The MRI protocol was performed on a 3-Tesla imager. The protocol included a sagittal T1-weighted gradient-echo sequence (MPRAGE) with and without contrast injection, 160 contiguous slices, 1-mm isotropic voxel, repetition time (TR) 2,300 ms, echo time (TE) 2.98 ms, field of view 256 mm as a basis for segmentation, and 3D T2 sequence. Identify the sella turcica anterior and superior to the clival recess in the midline. NOTE: In large and/or invasive pituitary tumors, the sellar floor may be very thin or completely eroded. The sellar floor is limited anteriorly by the depression that corresponds to the tuberculum sellae and laterally by the carotid prominences (C3 to C5 segments) and by the optico-carotid recesses. After identification of the carotid prominences laterally, open the sellar floor with a 5-mm large bone cutter to tailor or hinge a bone flap that may be repositioned at the end of the surgery. At this point, enlarge the sellar osteotomy laterally or anteriorly with bone rongeurs, according to the surgical target. NOTE: Some surgeons may prefer to open the sellar floor with a diamond drill and to enlarge the bone opening secondarily with a small bone rongeur. This procedure may be faster and it is generally used with extended approaches. However, the bone cannot be repositioned at the end of the procedure and attention should be paid to drill in the midline to avoid injuries to the carotid artery. Use neuronavigation to guide the procedure. Open the sellar dura with a micro-blade in the midline for a macroadenoma or laterally in cases of lateralized microadenomas. If needed, extend this dural opening laterally and take care to avoid any injury to the carotid arteries. Limit the risk of arachnoid breaches in the anterior recess by performing a small anterior opening of the dura and push up the dura with the suction tip to provide sufficient access to the sellar contents. Remove the tumor tissue with annular angled curettes, forceps, and suction tips. After an intra-sellar saline wash-out, use the 30 ° angled endoscope to inspect the intrasellar space and check for any remnant, particularly towards the cavernous sinuses. Ask for a Valsalva maneuver at the end of the resection procedure to detect a CSF leak before the closure step. Do not place any hemostatic material within the sella if not absolutely required, to enable a more accurate interpretation of the postoperative MRI. Obtain hemostasis within the pituitary sella with patient saline irrigation and slight pressure with cotton pads. Reconstruct the durotomy with a patch of bio-absorbable artificial dural substitute that is placed extradurally and reinforce it with a thin layer of surgical adhesive (e.g., bioglue). Replace the bone flap and secure it with surgical adhesive. NOTE: In cases where the sellar floor is drilled, the disarticulated rostrum or a piece of cartilage coming from the posterior part of the nasal septum may be used to close the bone defect. Other options of the use of synthetic materials (e.g., Porex plates) have also been described. Do not leave artificial material in the sphenoid sinus to avoid any chronic inflammatory reaction. Pay attention to the hemostasis of the nasal mucosa, particularly in the region of the nasoseptal branches of the sphenopalatine arteries on both sides, to prevent postoperative epistaxis. Gently replace the superior and middle turbinates in their original position with a blunt spatula. If a CSF leak has been observed during the procedure, pack the sella with a small fat graft. Do not use nasal packing unless strictly necessary. Provide adequate hormonal substitution in the perioperative period. Use intravenous hydrocortisone during the first 24 h (100 mg per day) and then provide an oral substitution (variable from case to case but at least 30 mg per day during the hospitalization). Twice a day, check blood and urinary osmolality and electrolytes, along with the urinary density. Monitor the urinary output constantly. Perform a hormonal check-up to evaluate the anterior pituitary function at day 4 postoperatively. Keep amoxicillin/clavulanate at 1.2 g twice a day till day 5 postoperatively. Provide standard analgesic treatment while combining acetaminophen and NSAIDS and provide tramadol for refractory pain. Constantly clean nasal fossa with saline solution to limit the risk of postoperative crostous rhinitis. Explain to the patient the importance of avoiding Valsalva maneuvers to allow a correct healing of the operative site during the first postoperative weeks. Perform an MRI in the early postoperative period only if the resection is suspected to be subtotal, if the intraoperative aspect is atypical for pituitary adenomas, or if complications are suspected. After standard procedures, perform the cerebral MRI at 3 months postoperatively. Perform a first evaluation 3 months postoperatively and organize follow-ups in collaboration with the endocrinology unit and schedule them according to the pathology and the extent of resection. Since 2009, our pituitary program has evolved to a point where a fully endoscopic endonasal approach has been used to treat pituitary tumors with excellent postoperative results. From 2009 to 2016, the two senior surgeons (RTD and MM) operated on 473 patients with pituitary adenomas through a full endoscopic technique. The histology is detailed in Table 1: most of these cases were non-functioning pituitary adenomas (57%) (Figure 1), followed by growth hormone (GH)-secreting adenoma (Figure 4) and adrenocorticotrophic hormone (ACTH)-secreting adenomas (20% and 17%, respectively). The resection rate was related to the histology of the pituitary tumors, the size, and the invasiveness of the cavernous sinus and sphenoid sinus, thus confirming the data of literature on this subject18. We achieved a total resection in 80% of patients with non-functioning pituitary tumors (Figure 1). When stratifying adenomas according to their invasiveness, a total resection rate was obtained in 90% of cases with no cavernous sinus invasion, while it lowered to 67% when the cavernous sinus was invaded. For secreting pituitary adenomas, the resection rate was variable and in some cases discordance was observed between the postoperative imaging and the endocrinological remission. Data reporting the postoperative endocrinological results according to tumor type are reported in Table 2. In this data, the relationship between the size of the tumor and its parasellar extension is evident. The biological remission varied from 90% for GH-secreting microadenomas to 30% with GH-secreting macroadenomas with cavernous sinus invasion (Figure 4). For ACTH adenomas, the remission was achieved in 55% of cases of macroadenoma and in 90% of microadenomas. When considering the ophthalmological outcome, we observed normalization or improvement of visual acuity and visual field size in 95% of patients with preoperative deficits. Five per cent of patients showed a stabilization of their visual status in the postoperative period. With regards to surgical morbidity, the overall mortality rate was less than 0.2% (one acromegalic patient died 1 month after surgery because of an ICA pseudo aneurysm). A CSF leak was observed in 8% of patients in the early part of the surgical series (2008-2011). The rate of this complication subsequently decreased to less than 1% with the adoption of a multilayer sellar floor reconstruction (2011-2016). Figure 1: Coronal views of the cerebral MRI of one patient with non-functioning pituitary macroadenoma with a large suprasellar extension. In the left panel, a T1-weighted MRI illustrates the sellar lesion (star) enlarging the sellar fossa and with a mass effect on the optic chiasm. The image of the central panel illustrates the same lesion after gadolinium administration: a diffuse contrast enhancement is present in the tumor and the normal hypophysis is not visible. The postoperative control is reported in the right panel: a complete resection of the macroadenoma was possible through a full-endoscopic endonasal procedure. 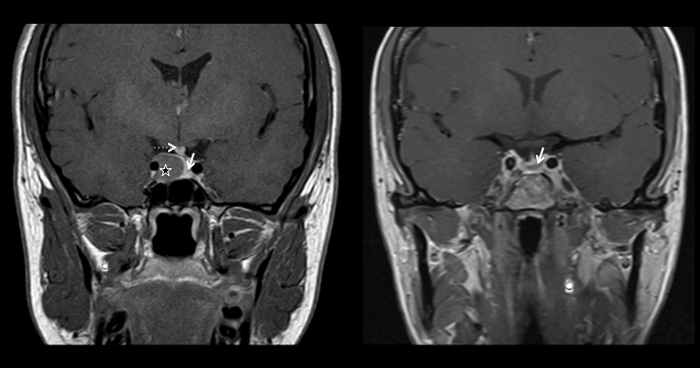 The normal pituitary is now visible in the sella, as well as the pituitary stalk, which appears slightly deviated to the right (hyperintense in the T1-weighted MRI, dotted arrow). The optic chiasm is returned to its normal position (white arrow). Please click here to view a larger version of this figure. Figure 2: Coronal views of a cerebral MRI showing a pituitary apoplexy (left and central panel) with its postoperative control (right panel). A T2-weighted MRI is reported in the left panel, confirming an enlarged sella containing a large lesion with a heterogenous signal confirming a hemorrhagic transformation (white arrow). In the central panel, a T1-weighted MRI with gadolinium administration shows a lesion with an important suprasellar extension, with a peripheral contrast enhancement, and a central core which appears hypointense. The optic chiasm is displaced (white asterisk indicating the right optic nerve; the left optic nerve is hardly visible because of the compression) and the patient presented thunderclap headaches and sudden visual loss in the left eye. He was urgently operated through an endoscopic endonasal approach and the results are shown in the right panel: the hemorrhagic macroadenoma was completely resected (right panel). The patient had a persistent anterior pituitary insufficiency but he completely recovered from the visual deficit. The optic chiasm is visible in its normal position (white asterisk in the right panel) Please click here to view a larger version of this figure. Figure 3: Multiple examples illustrating the pneumatization and the septa orientation of the sphenoid sinus. The sphenoid septum is classically described as median but many variants may occur and the examples illustrated here shows asymmetric septa to underline the utility of a careful analysis of the preoperative CT and MRI. In the left panel, a coronal view of the CT scan shows the presence of two septa in the sphenoidal sinus, lateralized toward the right side and even dividing the right lateral recess from the rest of the sinus (white arrows). In the middle and right panels, T1-weighted cerebral MRIs with contrast administration are reported. Septa may guide the surgeon toward the pituitary, the tumors, or the internal carotid artery (the right internal carotid artery is marked with an asterisk in the central panel; a micro and a macroadenoma are marked with a triangle and a star in the central and right panel, respectively). A good orientation is thus fundamental to correctly performing the procedure, achieving a maximal resection of the tumor, and avoiding complications, such as vascular injuries. An intraoperative neuronavigation may help in the management of cases with a complex anatomy. Please click here to view a larger version of this figure. Figure 4: Preoperative (left panel) and postoperative (right panel) T1-weighted cerebral MRI with gadolinium administration in the coronal plane. In the left panel, a well circonscribed lesion is visible in the right side of the sellar fossa (star), hypointense after contrast administration when compared to the normal pituitary, which is displaced to the left (white arrow). The pituitary stalk is also deviated to the left (dotted arrow). In the right panel, the postoperative control is reported, showing a complete resection of the macroadenoma (normal pituitary visible in the sellar fossa, indicated by the white arrow). The patient presented with clinical signs and symptoms of acromegaly, and the lesion was a GH-secreting pituitary adenoma. After the excision, IGF-1 descended to the normal range and a close follow-up was organized. Please click here to view a larger version of this figure. Table 1: Endoscopic endonasal surgery for Pituitary adenomas: Personal Case Summary (2009-2016). This table shows the distribution of the 473 pituitary adenomas operated between 2009 and 2016 according to the pathology. In 57% of cases they were non-functioning pituitary adenomas, in 20% GH-secreting adenomas while in 17% ACTH-secreting adenomas. Only 5% were PRL-secreting adenomas, because of the high rate of good outcomes with a medical treatment. TSH-secreting adenomas were rare (3 cases). Table 2: Endocrinological results of endoscopic endonasal surgery for Functional pituitary adenomas. The endocrinological outcome varied according to the histology of the pituitary adenoma, its size and radiological invasiveness, defined as cavernous sinus invasion at the cerebral MRI. A complete remission was obtained in the 3 cases of thyrotropinomas and in 90% of ACTH-secreting and GH-secreting microadenomas. A lower remission rate was obtained with GH-secreting and ACTH-secreting macradenomas and with GH-adenomas invading the cavernous sinus. For the majority of pituitary tumors, surgery remains the first-line treatment in case of symptomatic patients19,20. Only for prolactin (PRL)-secreting adenomas, the first-line of treatment is dopamine agonists and surgery is chosen secondarily when medical treatment fails21. Since the introduction of the endoscope in the field of skull base surgery in the early 1990's22,23, this technique has gained popularity in most medical centers24. This is primarily due to the direct access offered by this technique to the sellar region though the nasal cavities and to the panoramic vision of the whole region extending between the two cavernous sinuses and from the tuberculum sellae to the clival recess, thus conferring an advantage when compared to the limited view provided by an operating microscope. The nasal and sellar anatomy should be carefully analyzed preoperatively to avoid intraoperative complications. For pituitary adenomas, we prefer to perform a right uninostril approach, but in some cases a left uninostril approach may be used (based on the presence of an unfavorable septal deviation, polyps, previous surgeries, or depending on adenoma extension) or even a binostril approach. Local complications are lessened when the approach is limited to a uninostril approach. Neuronavigation systems improve a surgeon's orientation25. Between 2009 and 2012, we used the neuro-navigation system only for the surgery of recurrent tumors and in cases where the sellar anatomy was not favorable for an endoscopic approach (such as with conchal-type sinus). With the introduction of the magnetic neuro-navigation system in 2012, we now use this tool for all cases. Another key factor for the wider use of the intraoperative navigation is the possibility to predict the position of the internal carotid artery, thus significantly lowering the risk of vascular injury26. The results of the endonasal endoscopic approach for pituitary tumors must be interpreted according to several criteria. Tumors have to be classified from a biological point of view into functioning versus non-functioning adenomas and from a radiological point of view according to their size and the presence of invasion of the cavernous sinus. These criteria significantly impact the rates of endocrinological remission (for functional tumors) and complete resection (for all tumors). For non-functional adenomas, the rate of total excision in the series was 80%, which is comparable to the results from the literature, which range from 56% to 95%10,27. The endoscopic technique improves the rate of resection when compared to a microscopic approach essentially for Knosp 2 and 3 tumors, and for tumors having a cranio-caudal extension greater than 20 mm, as has been reported previously10. This advantage is due to the possibility of direct exploration of the lateral regions (cavernous sinus) as well as the suprasellar area with the endoscope. Angulated endoscopes are available, with the possibility of changing the angulation of the field of view during the procedure. For GH adenomas, the biological remission varied in the series from 90% for GH-secreting microadenomas without cavernous sinus invasion to 30% with GH-secreting macroadenomas with cavernous sinus invasion. The remission rate depends on the size of the adenoma and on its invasion of the cavernous sinus28 and better results were obtained for microadenomas and tumors without invasion of the cavernous sinus. Remission rates were of 78% for microadenomas versus 53% for macroadenomas, and 69% for non-invasive tumors versus 29% for invasive tumors. Corticotropic adenomas accounted for 17% of the series and the rate of remission was dependent on the size of the adenoma. Remission was achieved in 55% of cases with macroadenomas and in 90% of microadenomas. These results are comparable to the data reported in the literature, where the remission rate varies between 67% and 98%29. For PRL-secreting adenomas, the initial treatment is medical through the use of dopaminergic agonists. Surgery is considered as a second line treatment, in case of resistance to the medical treatment or intolerance or in cases of pituitary apoplexy. In the surgical series, the remission rate was 55% (all cases were macroprolactinomas), which is aligned with data from the literature, where remission rates vary from 34% to 79%30,31. Also for prolactinomas, the remission rates are significantly superior for microadenomas (88%) than macroadenomas30,31. Surgery for PRL adenomas also allows the reduction or discontinuance of medical therapy in 30% of patients, as has been verified by several groups30,31. TSH-secreting adenomas are very rare tumors and represent between 0.5% and 3% of pituitary tumors in surgical series32. We achieved a biological remission in all 3 patients of our series while the literature shows remission rates which vary between 71 and 100%33,34. Minor details of the surgical technique may vary between medical centers. The aim of the surgery is to perform a complete resection through a natural access while respecting the neuro-vascular structures. However, we would like to stress the fact that the closure is as important as the tumor resection and the necessary time should be spent to correctly perform this surgical step. In the future, we expect an increase in the application of endoscopic techniques in neurosurgery consequent to further technological improvements, such as reduced size and weight of the endoscopes, in combination with improved resolution and improvements in 3D endoscopic technology. In conclusion, the fully endoscopic endonasal approach is the gold standard of treatment for pituitary adenomas19,20,22,27 and is clearly superior to the operating microscope in visualizing the lateral extensions of the tumor10,11. A steep learning curve is necessary to get familiar with this approach. The extent of resection, as well as the biological remission rate, are related to the histology of the tumor, its size, and its lateral extensions into the cavernous sinus. The data are in keeping with data reported in literature. We would like to thank the endocrinology unit and the operative room team for their help and support in the management of these patients. We do not have any funding source for this work nor conflict of interest. Carrau, R. L., Jho, H. D., Ko, Y. Transnasal-transsphenoidal endoscopic surgery of the pituitary gland. Laryngoscope. 106, (7), 914-918 (1996). Kassam, A. B., Gardner, P., Snyderman, C., Mintz, A., Carrau, R. Expanded endonasal approach: fully endoscopic, completely transnasal approach to the middle third of the clivus, petrous bone, middle cranial fossa, and infratemporal fossa. Neurosurg Focus. 19, (1), E6 (2005). Jouanneau, E., et al. The endoscopic endonasal approach to the Meckel's cave tumors: surgical technique and indications. World Neurosurg. 82, (6 Suppl), S155-S161 (2014). Essayed, W. I., et al. Endoscopic endonasal approach to the ventral brainstem: anatomical feasibility and surgical limitations. J Neurosurg. 1-8 (2017). Messerer, M., et al. Extended endoscopic endonasal approach to clival and paraclival tumors: Indications and limits. Neurochirurgie. 62, (3), 136-145 (2016). Rotenberg, B., Tam, S., Ryu, W. H., Duggal, N. Microscopic versus endoscopic pituitary surgery: a systematic review. Laryngoscope. 120, (7), 1292-1297 (2010). Zaidi, H. A., et al. Comparison of outcomes between a less experienced surgeon using a fully endoscopic technique and a very experienced surgeon using a microscopic transsphenoidal technique for pituitary adenoma. J Neurosurg. 124, (3), 596-604 (2016). Juraschka, K., et al. Endoscopic endonasal transsphenoidal approach to large and giant pituitary adenomas: institutional experience and predictors of extent of resection. J Neurosurg. 121, (1), 75-83 (2014). Pratheesh, R., et al. The current role of transcranial surgery in the management of pituitary adenomas. Pituitary. 16, (4), 419-434 (2013). Messerer, M., et al. Evidence of improved surgical outcome following endoscopy for nonfunctioning pituitary adenoma removal. Neurosurg Focus. 30, (4), E11 (2011). Zoli, M., et al. Cavernous sinus invasion by pituitary adenomas: role of endoscopic endonasal surgery. J Neurosurg Sci. 60, (4), 485-494 (2016). Hamid, O., El Fiky, L., Hassan, O., Kotb, A., El Fiky, S. Anatomic Variations of the Sphenoid Sinus and Their Impact on Trans-sphenoid Pituitary Surgery. Skull Base. 18, (1), 9-15 (2008). Frank, G., et al. The endoscopic extended transsphenoidal approach for craniopharyngiomas. Neurosurgery. 59, (1 Suppl 1), ONS75-ONS83 (2006). Cossu, G., Daniel, R. T., Leviver, M., Sykiotis, G., Messerer, M. Pituitary metastasis and the role of CSF pulsations in secondary displacement after surgery. Journal of Neurology and Neurosurgery. 3, (2), (2016). Tarabay, A., et al. Primary pituitary lymphoma: an update of the literature. J Neurooncol. 130, (3), 383-395 (2016). Dehdashti, A. R., Karabatsou, K., Ganna, A., Witterick, I., Gentili, F. Expanded endoscopic endonasal approach for treatment of clival chordomas: early results in 12 patients. Neurosurgery. 63, (2), 299-307 (2008). Alfieri, A., Jho, H. D., Tschabitscher, M. Endoscopic endonasal approach to the ventral cranio-cervical junction: anatomical study. Acta Neurochir (Wien). 144, (3), 219-225 (2002). Trouillas, J., et al. A new prognostic clinicopathological classification of pituitary adenomas: a multicentric case-control study of 410 patients with 8 years post-operative follow-up. Acta Neuropathol. 126, (1), 123-135 (2013). Kuo, J. S., et al. Congress of Neurological Surgeons Systematic Review and Evidence-Based Guideline on Surgical Techniques and Technologies for the Management of Patients With Nonfunctioning Pituitary Adenomas. Neurosurgery. 79, (4), E536-E538 (2016). Lucas, J. W., et al. Congress of Neurological Surgeons Systematic Review and Evidence-Based Guideline on Primary Management of Patients With Nonfunctioning Pituitary Adenomas. Neurosurgery. 79, (4), E533-E535 (2016). Teixeira, M., Souteiro, P., Carvalho, D. Prolactinoma management: predictors of remission and recurrence after dopamine agonists withdrawal. Pituitary. (2017). Cappabianca, P., de Divitiis, E. Endoscopy and transsphenoidal surgery. Neurosurgery. 54, (5), 1043-1048 (2004). Jho, H. D., Carrau, R. L., Ko, Y., Daly, M. A. Endoscopic pituitary surgery: an early experience. Surg Neurol. 47, (3), 213-222 (1997). Borg, A., Kirkman, M. A., Choi, D. Endoscopic Endonasal Anterior Skull Base Surgery: A Systematic Review of Complications During the Past 65 Years. World Neurosurg. 95, 383-391 (2016). Buchfelder, M., Schlaffer, S. M. Novel Techniques in the Surgical Treatment of Acromegaly: Applications and Efficacy. Neuroendocrinology. 103, (1), 32-41 (2016). Shirakawa, M., Yoshimura, S., Yamada, K., et al. Effectiveness of Endoscopic Endonasal Transsphenoidal Surgery Using a Neuronavigation: Clinical Results of 178 Pituitary Adenomas. Journal of Neurology and Neuroscience. 7, (1:71), (2016). Dehdashti, A. R., Ganna, A., Karabatsou, K., Gentili, F. Pure endoscopic endonasal approach for pituitary adenomas: early surgical results in 200 patients and comparison with previous microsurgical series. Neurosurgery. 62, (5), 1006-1015 (2008). Starnoni, D., et al. Surgical treatment of acromegaly according to the 2010 remission criteria: systematic review and meta-analysis. Acta Neurochir (Wien). 158, (11), 2109-2121 (2016). Alahmadi, H., et al. Impact of technique on cushing disease outcome using strict remission criteria. Can J Neurol Sci. 40, (3), 334-341 (2013). Donegan, D., et al. Surgical Outcomes of Prolactinomas in Recent Era: Results of a Heterogenous Group. Endocr Pract. 23, (1), 37-45 (2017). Andereggen, L., et al. 10-year follow-up study comparing primary medical vs. surgical therapy in women with prolactinomas. Endocrine. 55, (1), 223-230 (2017). Onnestam, L., et al. National incidence and prevalence of TSH-secreting pituitary adenomas in Sweden. J Clin Endocrinol Metab. 98, (2), 626-635 (2013). Malchiodi, E., et al. Thyrotropin-secreting pituitary adenomas: outcome of pituitary surgery and irradiation. J Clin Endocrinol Metab. 99, (6), 2069-2076 (2014). Yamada, S., et al. Clinicopathological characteristics and therapeutic outcomes in thyrotropin-secreting pituitary adenomas: a single-center study of 90 cases. J Neurosurg. 121, (6), 1462-1473 (2014).